Apart from the wedding dress, the bride’s wedding hairstyle is one of the most important things about wedding appearance. It should bring out the best in you, emphasize your beautiful hair and complement the dress. But with all the different hairstyles you can find online and in the magazines, it can be really hard deciding on what style would suit you and your wedding look best. Below are 5 tips to help you get your wedding hair just right! There are many styles you will see and love and want to wear on your wedding day. But not everything will suit you, your personality and your wedding style. So stay realistic and narrow it down to what you think would really suit you and your style best. Don’t get your wedding hair done for the first time on your wedding day. Try out different hairstyles before. Look in the mirror, take photos and sleep on it. Then compare the different photos and decide what you think works best for you. Keep in mind, that you will be wearing the hairdo for long hours, so you might want to keep it on the low maintenance side. And not too tight. The hair is certainly one of the wedding “items” you should not be choosing by yourself. Always have a friend with you to give you advice. They are the best mirror. Sometimes you can see a hairdo and think it suits you, but it maybe really doesn’t. And this is where those bridesmaids could really come in handy and give you some tips on what really accentuates your features and would look best on you when you stand in the spotlight on your big day. Keep your hair maintained. If you’re thinking of cutting your hair shorter or dying it a different color, don’t wait for the wedding day. You don’t want to deal with a hair disaster in the last minutes before the wedding. Obviously, you don’t want roots to be showing, but you don’t want to dye it a day before the wedding only to realize the shade is a bit off! Allow your hair to adjust to the new color or haircut and give yourself some time for hair recovery, just in case you won’t like the new style. And keep your hair nicely trimmed, so there are no split ends showing on the wedding photos. Visit different hair salons and talk to different hair stylists. 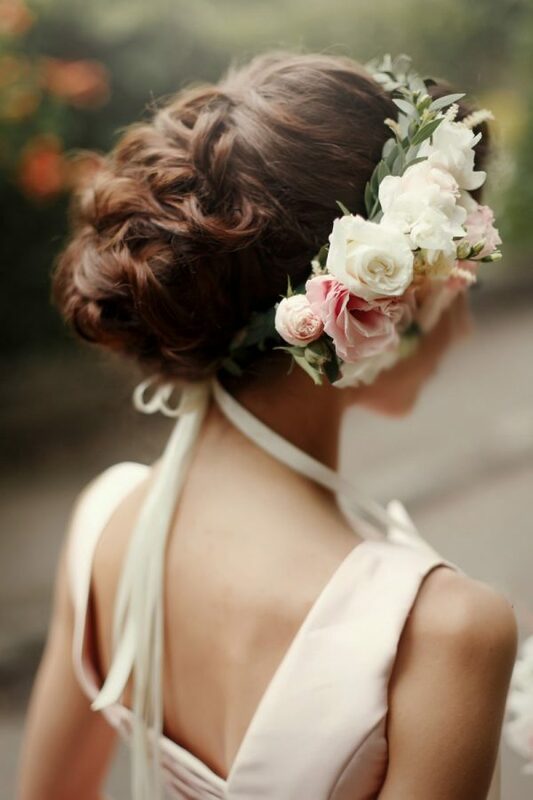 If you have a salon you regularly visit, ask if a certain staff member specializes in wedding up-dos. It’s your wedding, so you want someone who will be able to advise you what’s best for you. And meet your needs, while still giving you the perfect style for you! And once they start working on your hair, it’s time to speak your mind! If you don’t like what they’re doing, this is not the time to be polite and not sharing your opinion. You don’t want to be desperately crying hours before the wedding because you didn’t speak your mind.